Your company finally has a formal purchasing program and now you need a purchase order template that reflects your organization’s professionalism, as well as look and feel. It’s tempting to just reuse the same purchase order form and make adjustments as you go, but a proper purchase order template is easy to use and includes vital information about your company. It’s time-consuming to recreate every time you need one done, so why not use a proper purchase order template? Before we delve into the intricacies of design, let’s go back to the basics and re-examine why purchase orders are integral to your company. A purchase order is a document sent from a buyer to a supplier or vendor with a request for a good or service. The purchase order includes the type of item or service, quantity being purchased, and the agreed upon price. It also includes the buyer’s name, logo, and contact information, as well as the vendor’s name and contact information. This document sets out the guidelines for the purchase, such as the date to be delivered, the delivery location, the frequency of delivery and any other vital information related to the transaction. Each purchase order has its own number, so the document can be easily found, referred to and easily pulled up in case of a dispute. Purchase orders are legally binding contracts between the buyer and supplier, which can help save your company if something goes awry. Once the supplier has accepted the purchase order, a contract exists between the two parties: one will provide the good or service ordered and the other will pay for it. The best purchase orders are easy to use and easy to read, containing only information vital to the order. They’re also efficient for record keeping. Procurify offers a free purchase order generator that will help you generate a business-ready P.O in a ready-to-send .pdf format. 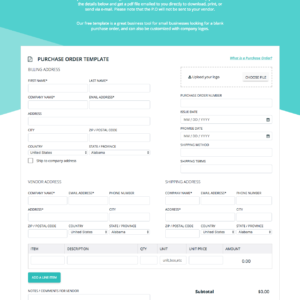 Purchase Order Template offers a variety of free, customizable purchase order templates. All you need is Microsoft Excel to put them together, which makes it pretty simple! Xero provides customizable purchase orders that come with a free trial. They also offer accounting options for small businesses to help the whole purchase order process go as smoothly as possible. Zoho Books offers a 14-day free trial and provides purchase orders and tracking options for purchasers. We may be biased, but no list of purchase order templates is complete without a completely paperless and digital option. With Procurify we help you to track purchase requests and approvals through the web or mobile app, and create automatic digital POs that are sent to your purchaser for action. Of course, you can use any of these as inspiration as you craft a purchase order that works best for your business. No matter which template you choose, having one on hand will certainly speed up the process and ensure you’re always getting all the information you need and no integral details are being missed.